It was only a matter of time before someone caught up with her. Avry’s not sure whether to be thankful or furious that Kerrick and his band of ruffians are the ones to find her. On the plus side, they aren’t actively trying to kill her. Not like the villagers they rescued her from, who had already measured Avry for her coffin. But on the other hand, Kerrick makes it very clear that he only needs her alive to heal his fallen leader from the plague. The fact that doing this will result in Avry’s death is apparently not a concern. Still, a quick death now or a chance to live another day proves to be an easy choice – and no one could have anticipated the twists on Avry and Kerrick’s path. The most important thing I want to establish about Snyder’s writing is this: her characters are wonderful. I’ve been reading plenty of female protagonists recently, all trying their best to be strong, independent women. Snyder has this nailed. Avry is the latest in a series of Snyder’s (admittedly all quite similar) exceptionally well established female leads, and she is the foundation of this novel: a force of nature in the best possible way. So, Avry’s awesome. If you need more reason to read the book beyond the very cool plot and the excellent main character, then fear not, Snyder has you covered. The other characters populating Touch of Power are just as well written. Snyder treats all her creations as equally important, making for a rich tapestry of personalities. Kerrick is not as horrible as we first assume – but neither is he the so often seen big softie who just needs to realise how pretty our heroine is and then he’s lovely all the time. The other members of this gang are also great – if you don’t love Belen, the Monkeys and Flea, then I don’t even know what to do with you! The world Avry and Kerrick inhabit is satisfyingly imagined, with more political machinations than you can shake a stick at, and I was actually surprised by the plot twists, with only one or two moments of: “Ugh, saw that coming.” I’m eagerly awaiting the sequel, now, because there is much yet to be resolved here, and I care too much about the characters to be patient! 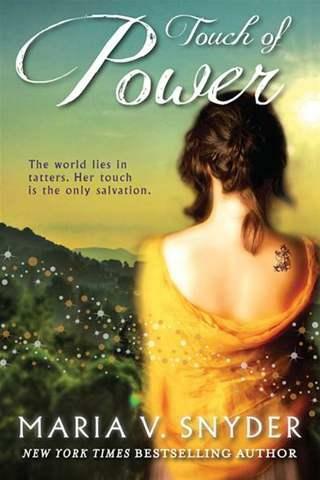 This novel was fantastic: if you like YA Fantasy, intelligent stories, realistic and satisfying characters and strong writing, I can’t recommend Touch of Power more highly. Have you read anything by Maria V Snyder? If not, what are you waiting for?! *This is, of course, a highly subjective award that only relates to books I’ve read this year. But don’t let that take away from the huge honour!